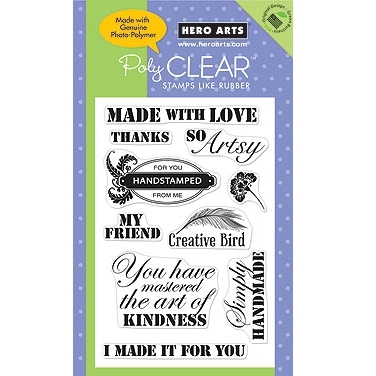 A message set designed to show off your creativity, including 10 phrase stamps such as 'I made it for you', 'Simply Handmade' and 'Made with love'. This 4x6" PolyClear set is made from genuine photo-polymer for true impressions every time. They stamp like rubber and are easy to use, easy to clean, always cling and are non-toxic.